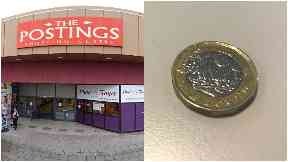 The Postings in Kirkcaldy has a capacity of 21 stores, but currently only seven units are occupied. A shopping centre in Fife will be auctioned on Tuesday - with a starting price of just £1. The Postings attracts more than 30,000 visitors each week. However, it has seen revenues decline with the rise of online shopping. A spokeswoman for the owner, Columbia Threadneedle, confirmed that bids for the building will start at £1. "We acquired The Postings more than 15 years ago as an income proposition," she said. "The reserve price of £1 is generating significant attention and we expect to get a considerable amount at the auction." London-based auctioneers Allsop will put The Postings under the hammer on Tuesday at 10am. The auction will be live streamed via their website.